I neglected the followers of sankey-diagrams.com for almost two months … had a surgery done, but now I am back for good. Just to get started without any further delay, here is a Sankey diagram I dug out from my collection. Not sure on which website or in which article I found this, but it is still hosted on imageshack. The diagram is from Poland and seems to show cogeneration. 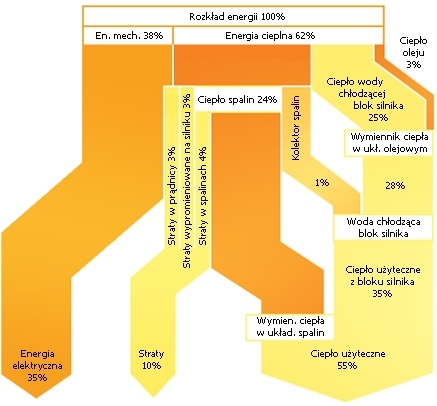 Flows represent percentages and are not always to scale (compare 10% flow ‘Straty’ and 35% flow labeled ‘Energia elektryczna’). The label “1%” on the flow for ‘Kolektor spalin’ must be a mistake, I reckon it should read “7%”.